Jaroslav Hájek was brought up in Podebrady, the town of his birth, which was a spa town well known as a place where people could go to recover from heart problems. He attended primary school there but when he entered a Gymnasium it was in Prague. Of course World War II began while Hájek was studying at the Gymnasium in Prague. After the German armies took Prague, Hájek was forced to work for the German armament industry. He completed his disrupted secondary education around the time that the war ended and, after graduating from the Gymnasium, he entered the Czech Technical University to begin a course of statistical engineering. 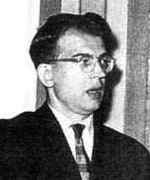 In 1947, although only two years into his undergraduate course, Hájek began teaching as an Assistant Lecturer in the Mathematics Institute at the Czech Technical University where he studied. He received his Diplom in Statistical Engineering in June 1949, the same year as his first publication appeared. He was among the pioneers of unequal probability sampling. The name "Hájek predictor" now labels his contributions to the use of auxiliary data in estimating population means. Hájek's secondary school education had been disrupted by the war but this was not the end of the disruption to his career for after receiving his Diplom he had to spend two years doing military service. It was 1951 before he was free to begin his postgraduate research studies which he undertook at the Mathematical Institute of the Czechoslovak Academy of Sciences. In 1954 he was awarded his doctorate and he continued to work in the Mathematical Institute as a Senior Research Worker. The year he received his doctorate, Hájek married Alzbeta Galambos, who was known as Betty. This was a happy time for Hájek as he and his wife enjoyed bringing up two daughters born in the first five years of their marriage. For twelve year Hájek worked as a Senior Research Worker in the Mathematical Institute of the Czechoslovak Academy of Sciences. It was a productive period during which he wrote 20 papers and two books: The theory of Probability Sampling with Applications to Sample Surveys and Probability in Science and Engineering which he wrote jointly with V Dupac. During these years Hájek established himself as a foremost international authority in several different fields of statistics, particularly in nonparametric methods and their asymptotic theory. His reputation led to an increasing number of invitations to international statistical events, to service on editorial boards of international journals, and to longer stays in foreign universities as a Visiting Professor. One important such visit was to the University of California at Berkeley which he made in 1961-62. There Lucien Le Cam was the Chairman of the Department and, despite the pressures of that role preventing him from doing as much work with Hájek as he would have liked, it was still a very useful visit. The notion of contiguity had been developed independently by Lucien Le Cam and the present author. Hájek developed the property of sequences of pairs of probability measures from ideas due to de la Vallée Poussin. Both Hájek and Le Cam used the concept but the name 'contiguity' is due to Le Cam. From the moment Hájek assumed the Chair, he directed great efforts towards reforming both the content and the method of teaching, which were then, admittedly, somewhat old-fashioned and obsolete; and he succeeded. in the course of the years, he brought together a group of graduate students whom he tutored and oriented in such a superb manner that the majority of them have become renowned researchers in various fields of statistical theory. In 1967 Hájek published (jointly with Z Sidak) Theory of rank tests but it was a work which had in fact been written four years before in 1963. Their methods use three lemmas of Le Cam in order to treat rank statistics under local alternatives and they established the efficiency of rank tests. Hájek's health was poor for many years as he suffered from a kidney disease. By 1970 his condition was deteriorating steadily but he bravely continued his work. He proposed an International Statistical Conference for Prague and set about inviting the main speakers. The conference Prague Symposium on Asymptotic Statistics took place in 1973. Hájek realised that the conference would be his last opportunity to meet many of his friends and colleagues and indeed it proved to be the case as he died from the kidney disease several months later. We should mention two further books by Hájek. These are A course in nonparametric statistics (1969) and Sampling from a finite population which was published in 1981, seven years after his death.